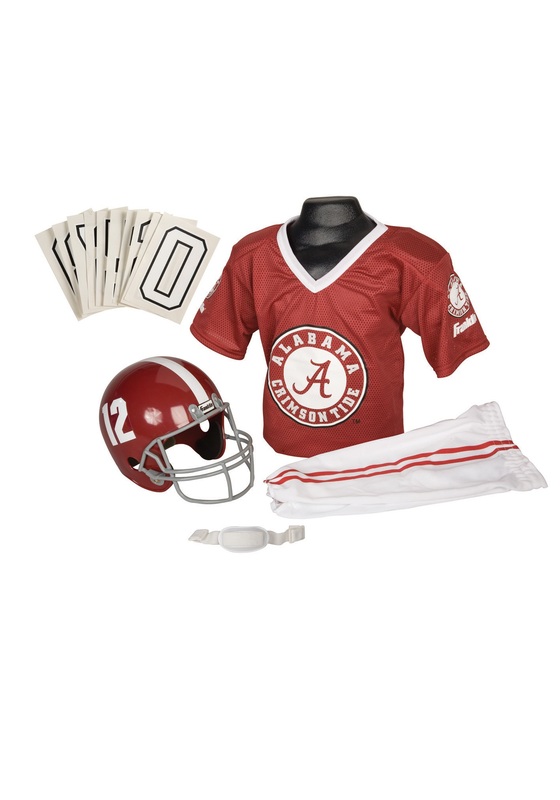 Your little one would make the legendary “Bear” Bryant proud in this Alabama Crimson Tide costume. Whether you’re doing imaginary battle against rival LSU, Tennessee or Auburn, you’ll be the hit of the gridiron in this official licensed uniform. You can just about hear the thousands of rabid ‘Bama fans in the stands cheering you on as you run past the 50, the 40, the 30, the 20, the 10, to score a TOUCHDOWN for your favorite team! Yea Alabama! Drown ‘em, Tide! Every ‘Bama man will be behind your kid in this Crimson Tide Child Uniform. Surprise dad for this year’s Iron Bowl with a Crimson Tide getup for his little lap quarterback! Have him practice his best Rammer Jammer Cheer to impress everyone on game day! The university may have to keep rolling back its aggressive chants as the definition of sportsmanship shifts, but there’s nothing stopping you from chanting that you’re gonna beat the heck out of ‘em in the privacy of your own man cave! Your child will be ready to cheer the team from the sidelines with Big Al and the Million Dollar Band in this officially licensed Alabama Crimson Tide Child Uniform. This sporty kit from Franklin Sports has everything your little one needs to dress like he’s on the roster of your favorite team! It includes an iron-on number set so he can emulate his favorite player. So roll on to victory, hit your stride––your Dixie’s football pride in this fantastic collegiate football set!